Contains wheat-germ which naturally offers significant amounts of vitamin E to promote long-term health and vigor plus linoleic acid which promotes healthy organs and improved reproductive capacity. The digestive characteristics of wheat-germ allow your fish to take full advantage of the complete nutrition in each Hikari Cichlid Excel pellet. In our quest for the best ingredients, only pure cultured Spirulina is used offering a vibrant color enhancing effect not normally seen with competitive brands. 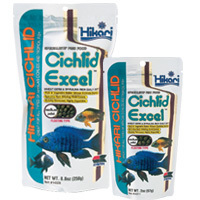 Hikari Cichlid Excel is high in stabilized vitamin C which promotes resistance to stress and immunity to infectious disease thereby allowing your pet their best chance at maintaining good health.